SUMMARY: When she accepts a temporary job cleaning cages at a circus, Kelsey feels inexplicably drawn to a particular white tiger. When she discovers the tiger is a prince who was cursed 300 years ago, she travels into the jungles of India to help him break the curse. WHAT I LIKED: Every now and then a book comes along that makes me a terrible mother. It makes me stay up way too late, neglect my poor children, overlook the dirty dishes, and even skip the gym. It makes my students look at me like I'm nuts when I get that wild-excited look in my eyes and just cannot stop talking about that book. Tiger's Curse was such a book. Oh, how I loved, loved, loved this book! Kelsey and Ren have major romantic chemistry, and the romantic scenes, while they never go beyond intense kissing, are sensual and oh-so-beautifully written. I loved Kelsey and Ren's loyal friendship and playful banter. Kishan is a particularly interesting character, and the possibility of a love triangle among Kelsey, Ren, and Kishan is just plain juicy. The Indian mythology, geography, and landmarks are thoroughly researched. Author Colleen Houck makes readers feel the sticky humidity of the jungles, the cool quiet of the caves, the simple beauty of a secret waterfall, and the unrelenting ferocity of a thunderstorm. I know nothing of Indian mythology beyond what is in Tiger's Curse, but reading this book made me want to research further (particularly the Kappa and vampire monkeys--WOW). I have not been this obsessed with a fantasy series in maybe forever. It's been awhile, but I don't even think Harry Potter drew me in this much. I talked about Tiger's Curse all day today to anyone and everyone who would listen, and it now our one library copy has a hold list five students and two teachers long. I ordered two more copies today because it is sure to be a hit with my middle schoolers. 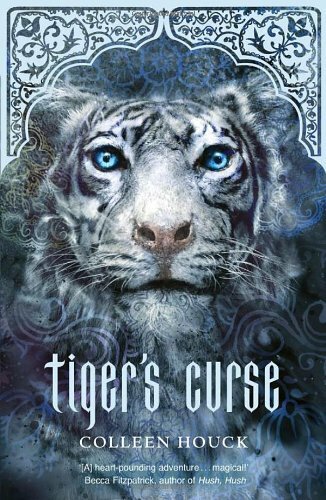 In two weeks, I am presenting the "Best of 2011" booktalk at a regional librarians conference, and I added Tiger's Curse to the list of books I am presenting. If you have not read this book, you are seriously missing out. I don't have the sequel Tiger's Quest yet, but I ordered it today for the library. I requested an ILL at the public library today, so it should just be a couple of days before I get my hands on it. There's no way I can hold out for three weeks waiting for my school's order to come in. WHAT I DIDN'T LIKE: *sighs deeply* If I had to say one thing I didn't like, it would be only one very, very minor thing. The first 70 pages or so were just a little dull, especially when compared with the rest of the book. Readers who struggle with the beginning (before Kelsey goes to India) are strongly advised to keep reading. I promise it gets better. TRAILER & COVER ART: The trailer is unique and is what made want to read the book in the first place. I've seen two covers, and while both are gorgeous, I prefer the icy blue cover to the clearer close-up of the tiger. Violence: mild; there are vampire monkeys and tiger fights. STATUS IN MY LIBRARY: We have it, and I loved it so much that I doubt it will see much shelf time at all this year. Ordered 2 more copies today.